Tom Matta is the VP of sales at eShares, a software platform that allows investors and companies to manage cap tables and grant stock certificates digitally. With over 7,500 companies on eShares and thousands of salespeople on the platform, I’ve noticed a few things about how venture-backed companies typically reward sales employees. Here, I’ll dive into the average equity compensation by role and by round, and some unorthodox incentive structures companies use to add equity as part of sales commission. As you know, early-stage companies are equity rich and cash hungry. Therefore, employees receive significantly more equity by joining companies at the seed stage. 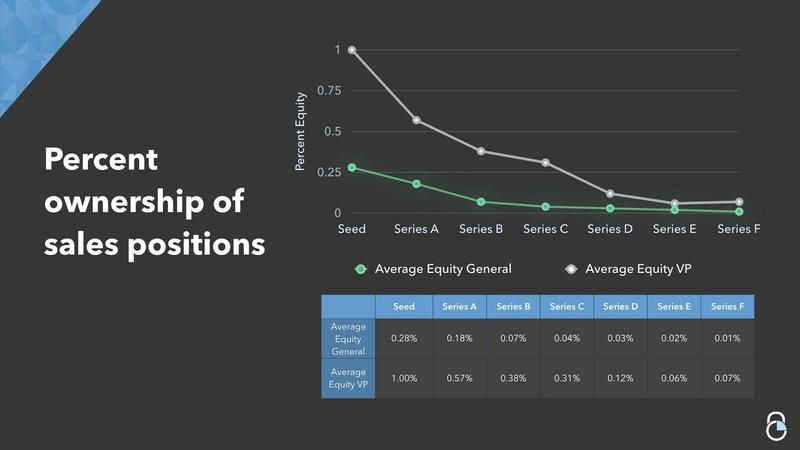 In sales, the difference between joining at the seed stage versus series A is a 50% loss in equity. Even at seed stage companies, the VP of sales is given less equity than more standard executives. At seed companies they get an average of 1% of equity, while CTOs get 2.03% and COOs get 1.84%. However, they are given more than seed stage CFOs at 0.84% and VPs of marketing at 0.95%. While giving equity to executives is standard practice at startups, it is not always the case with junior sales employees. Most startups do not have a “true” VP of sales at the seed stage and often are willing to hire someone more junior into a sales role, rather than hire an executive as they may with a CTO or CEO. CFOs and VPs of marketing are usually brought in at later stages which may explain their lower equity stakes. Companies seem reluctant to reward sales people with equity, probably because sales is such a fast-paced department and typically has high turnover. Long-term gains from equity are less associated with this atmosphere. Even high level sales executives at established companies have monetary rewards tied to revenue growth. The association between sales and cash has seeped into the executive level. If you are in sales and are equity hungry, you may want to find ways to tie your commission to equity. In keeping with the goal-oriented culture of sales, many companies have transitioned from the typical time based vesting to a sale milestone vesting for their sales force. In milestone-based vesting, equity is given in parts, dependent on meeting a certain sales criteria. For example, on the eShares platform, a company had one-fourth of the options vesting on a traditional monthly schedule. The rest vested based on units sold, so they vested the remaining three-quarters of their total shares after selling 100, 250 and 500 units of product, one-fourth at a time. This means that successful sales employees can vest much more quickly. Faster vesting could reduce a salesperson’s incentive to stay at your company, one of the reasons why keeping some amount of shares on a traditional monthly vesting is important. Whether you’re an executive or junior-level employee, you will have to fight for equity. As a VP, get in early and as an employee, push for equity-based commission if you are committed to having a substantial stake. While rewarding sales with equity may not be as common as in other departments, it is on the rise. Don’t be afraid to ask for it or, as a manager, to give it out if you are low on cash. If sales is an important sector of your business, represent that value in equity.